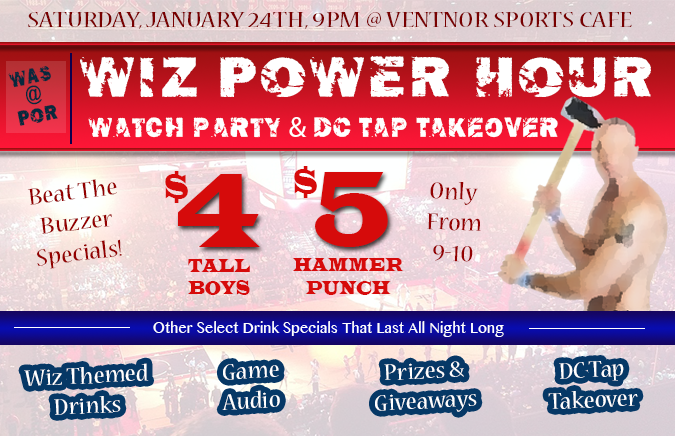 Washington Wizards Fan Happy Hour: Wiz Power Hour On Saturday in Adams Morgan! Wiz Power Hour On Saturday in Adams Morgan! Thank goodness the whole KD2DC thing is over. We have a bad taste in our mouth from the loss to the Thunder so we are jumping right back in to the fray with a Wizards watch party on Saturday night in Adams Morgan! Join us at Ventnor Sports Cafe to watch the Wizards @ Blazers with all of your Wiz friends starting at 9pm with power hour specials before tip. We have a lot of great stuff planned including prizes, giveaways, beat the buzzer specials, Wizards themed drinks, game audio, and drink specials all night long. You are going to want to arrive early for this one. The game tips at 10pm and for one full hour before we are doing a special layup drill. There will be $4 tall boys and $5 polish hammer punch for just one hour before tip. Once the buzzer sounds this deal disappears, but don't worry there will be a bunch of awesome Wizards themed drinks & specials all night long!